The Amare rotating wall cabinet with mirror takes modern looks and bathroom storage to the next level with its clever design. Featuring a space-saving design which rotates 360 degrees. This cabinet combines a full length mirror on one side with three large storage spaces and integrated towel racks on the other. This unit mounts to the floor and wall and metal mounting hardware is included. Reminiscent of a Swiss Grandfather clock and crafted with the same meticulous attention to detail, this Linen tower cabinet is an exquisite complement to a bathroom vanity. The clear glass of the upper door allows for subtle interior colours to show through creating a delightful tempering effect. Dimension: 18WX16.3DX65H * ** * Birch* Espresso* Antique brass finish hardware* No Assembly Required Faucet and mirror not included. Professional installation recommended. The ClosetMaid 2-Door Raised-Panel Wall Storage Cabinet is durably made of laminated particleboard with a UV-protected white finish. Perfect for a wide range of spaces including a garage, garden shed, workshop or laundry room, this cabinet provides ample storage with 1 fixed shelf and 1 adjustable shelf and is easy to assemble and easy to mount on walls. As stylish as it is functional with brushed-nickel plated hardware and sculpted panel doors, this cabinet has 6-way adjustable hinges and is sturdy and strong for long-lasting use. The Glacier Bay 24 in. White Hampton Bath Storage Cabinet is a stylish and functional storage option to match any traditional decor. A strong melamine and medium-density fibreboard (MDF) construction is matched by a beautiful bright white finish in thermoplastic, a material that is easy to maintain and to clean. Nickel-plated steel hardware in included for a touch of elegance and two adjustable shelves offer increased storage space. Featuring high quality European-style adjustable concealed hinges and a decorative trim, this cabinet is backed by a limited lifetime warranty. Pair with a matching Hampton Vanity or Mirror for a great look. 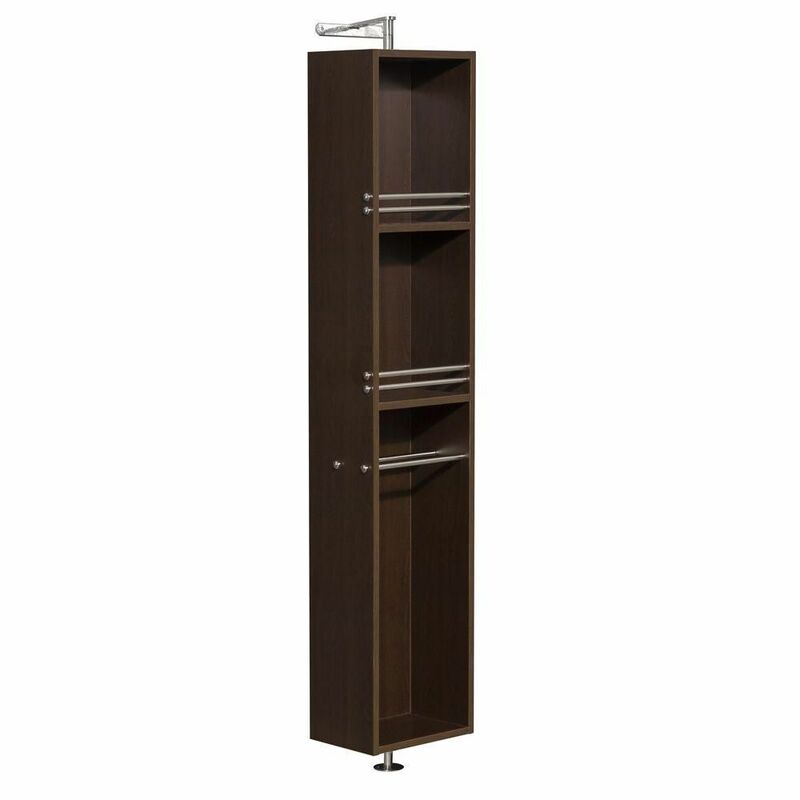 Amare 13-3/4-inch W x 73-inch H x 15-inch D Bathroom Linen Storage Cabinet in Espresso The Amare rotating wall cabinet with mirror takes modern looks and bathroom storage to the next level with its clever design. Featuring a space-saving design which rotates 360 degrees. This cabinet combines a full length mirror on one side with three large storage spaces and integrated towel racks on the other. This unit mounts to the floor and wall and metal mounting hardware is included.